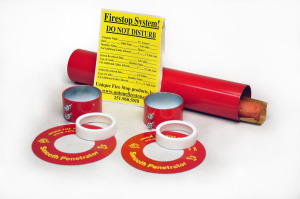 The UNIQUE Threaded Firestop Sleeve is used for new cable installations through cinder block, cement, masonry firewalls or 3″ slab floor. UL Classified for up to 4 hours horizontal and 3 hours vertical. Made in the USA. 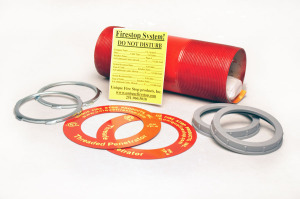 UNIQUE’s Threaded Firestop Sleeve is our most robust system. Designed for new cable installations where the hole through the firewall or floor is core bored or pre-cut. 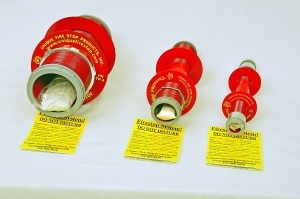 UL Classified for up to 4 hours horizontal and 3 hours vertical. Extremely well-made. The UNIQUE Threaded Firestop Sleeve is constructed of rigid steel tubing that is threaded on both ends and made of (IMC) Intermediate Metal Conduit. Available in 3 sizes on this page. Order by 10 am for delivery tomorrow. To order extra long or extra short systems for custom applications, call the factory at 251-960-5018. 24 hour turnaround on Special Orders! 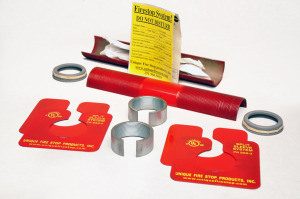 Threaded Firestop Sleeve System consists of a 12 inch length of threaded rigid conduit, (2) large washers, (2) threaded couplings, (2) threaded bushings, a documentation/warning label, and a package of UNIQUE Intumescent Putty. Pre drill the hole in advance. BE SURE to drill the hole to the outside diameter (O.D.) of the System you will be using. 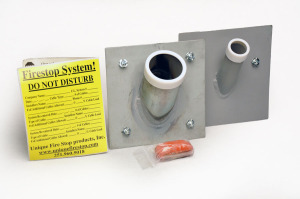 A 4 inch System will require a 4 & 1/2 inch hole minimum! Most people should drill a 5 inch hole for the 4 inch Threaded Sleeve. Remove the documentation warning label. Disassemble one side of the System. Adjust the coupling, washer and bushing so that the sleeve will protrude evenly on both sides when installed. Feed the System into the hole you have pre-drilled. Go below and install the other half of the hardware. The vertical application of the Threaded Sleeve requires the sleeve be packed (3 inch depth) with mineral wool batt insulation. This keeps gravity from having any effect on the intumescent putty. This System used horizontally, needs no wool batt. 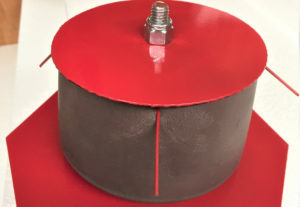 When the cables reach their destination, install an minimum 1/2 inch thickness of Unique Putty per the vertical application. This System used horizontally, needs a minimum 1 inch thickness of putty. See our UL Systems. Fill out and attach the documentation/warning label and take a picture of your completed installation for future reference. Determine sleeve size and penetration point that you want to make in the firewall/ floor. Ensure hole will accept the outside diameter of System to be used. Example: 4″ Threaded Sleeve outside diameter is 4.5 inches. Up to 48% of the aggregate cross sectional area of the sleeve may be filled with cables if the system is used vertically or horizontally for up to 2 hours. The 4 hour listing is limited to 34% cable load. The remaining void should be filled with an intumescent fill material and/or mineral wool. Disassemble the system leaving one coupling and bushing on the sleeve at about the right depth for your firewall/floor to equalize the protrusion on both sides. Slide the washer on the sleeve while installing the top or first side of the sleeve in the wall/floor. Push assembly firmly against wall/floor, seating the first washer. Install the plastic bushing. Go to the other side of the firewall/floor and slide the washer over the system and seat it against the wall/floor. Thread the second coupling up to the second washer. While holding the system, tighten by hand until sleeve is firmly in place. Install the remaining bushing on the sleeve. Route cable through the system and pull it on to its destination. Document the installation with the supplied warning label. Refer to other tabs on this page for Fill Charts, Installation Pictorials, and UL Listings. For Free Training, click here.